That's almost $15k cheaper than the Demon. For a model as old as it is, Dodge sure has done a heck of a job at keeping the Challenger not only relevant, but still eminently desirable for muscle-car fanatics. And now it's done it again with the release of the latest models. For 2019, Dodge and SRT have released the new that packs nearly as much muscle as the – with 797 horsepower and 707 lb-ft of torque to run from 0-60 in just 3.4 seconds, the quarter-mile in 10.3, and top out at 203 mph. With pricing now revealed, the Redeye tops the lineup at $69,750. Which is hardly cheap, but it presents one heck of a bang for all that buck. More to the point, it's nearly $15k cheaper than the Demon, yet packs nearly as potent a punch. Too rich for your blood? Well we have good news for you in that case, too, because the next-best SRT Hellcat is now even more potent (at 717 hp and 656 lb-ft of torque), yet now starts at $58,650 – a good $5k less than last year's model. Further on down the line, the Challenger R/T offers what FCA terms as “the most affordable V-8 in the segment,” priced from just $34,100 and boasting 375 hp and 410 lb-ft of torque. Upgrade to the R/T (which brings output up to 485 hp and 475 lb-ft) and you'll be shelling out $38,995. And if you don't need all eight cylinders, the base V6-powered Challenger SXT “is the most affordable V'6 automatic in the muscle car segment” starting at only $27,295 (with the GT starting at $29,995). 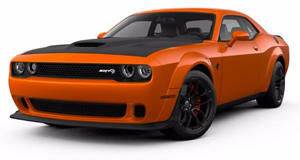 Plus the Challenger boasts the only in its class for $39,295 in SXT AWD trim and $32,995 in GT AWD.